Funny name, huh? Obviously, this restaurant sells seafood. And I love seafood! I also love cocktails! 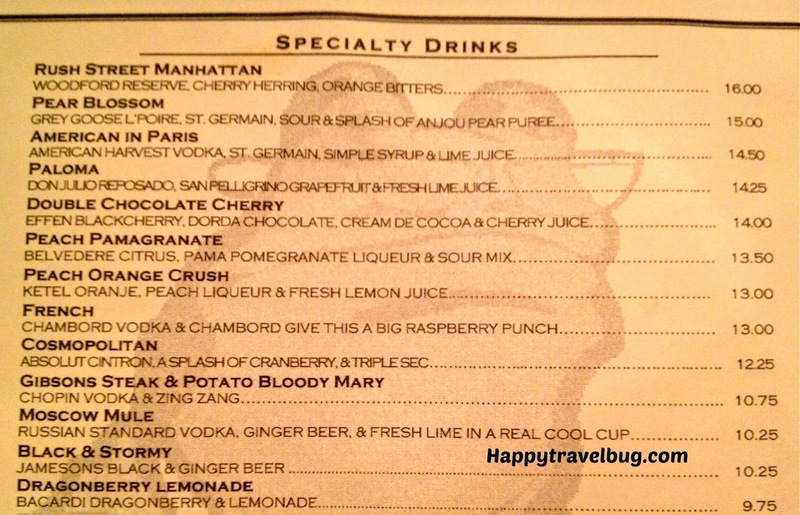 So I decided to have the Moscow Mule from the menu below. I had heard Oprah (check out when I attended her show) say this was her favorite drink at one time. Plus, I fell for ginger beer the first time I tried it in Bermuda. So I figured I couldn’t go wrong with this drink. I was correct…loved it! 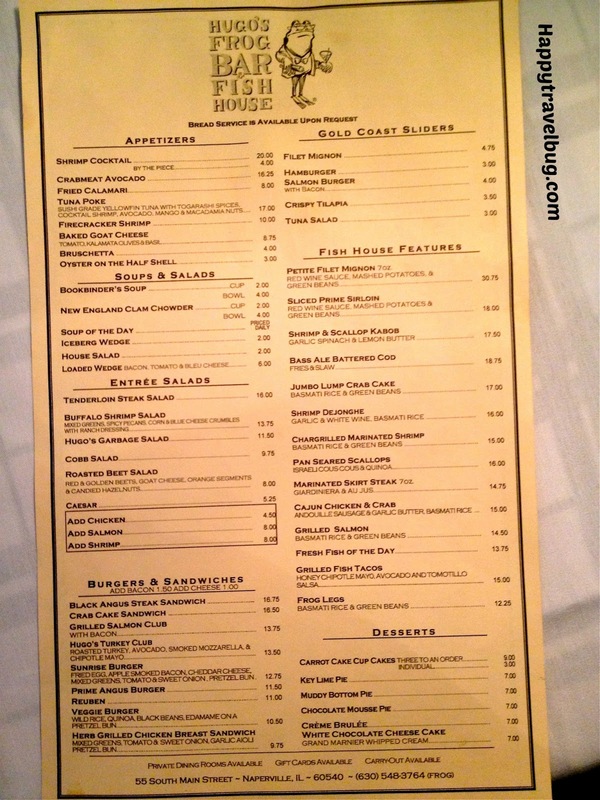 Next came the hard part…trying to decide what to eat from the yummy menu offerings! 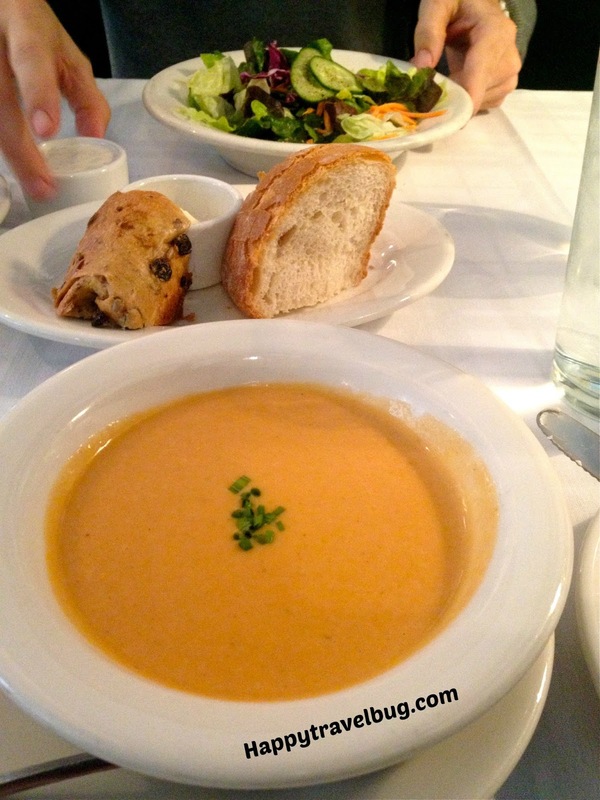 It wasn’t as hard as I thought because I love lobster bisque! Whenever I see it on the menu I have to try it. It was actually the soup of the day when I was at Hugo’s, so my decision was made. Another winner! I always think there could be more lobster bits, but it tasted creamy and delicious. My husband went with the house salad. There were many yummy things I wanted to try for my entree, but the fish tacos were calling my name. They had me with honey chipotle mayo and avocado. YUM! I could eat fish tacos anytime, but only like to order them when I feel the fish will be “quality”. These did not disappoint in any way, shape or form. The combination of the crispy slaw with the creamy avocado was just the right texture. Plus the kick from the chipotle mayo and cilantro added just the right touch. My husband ordered the fresh fish of the day. It was served with rice and spinach and it was delicious. I don’t think you can go wrong with the “of the day” thing. Plus, it is always fun to try something that isn’t usually on the menu. Especially if you frequent a restaurant often. 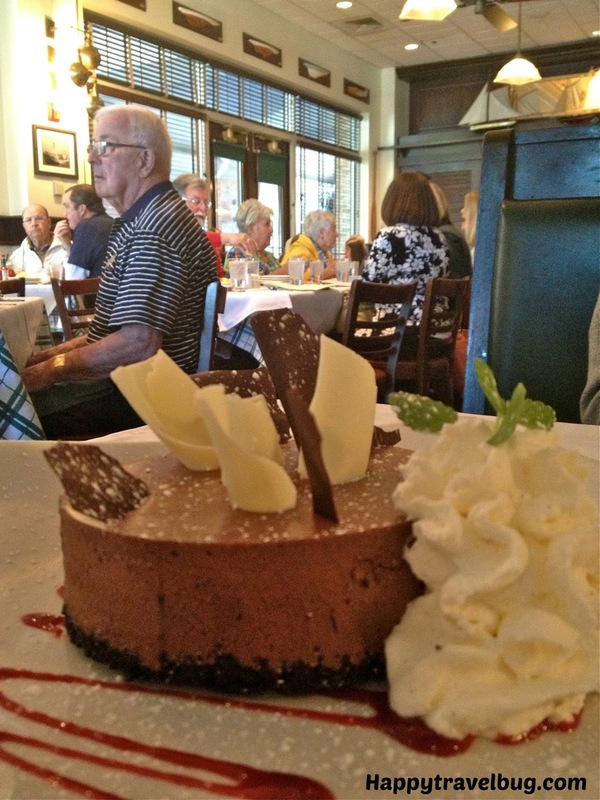 Never ones to pass up dessert, especially if it involves chocolate, we ordered the chocolate mousse pie. I think you need a close up of that! It looks like a real treat of a meal. Not sure I'd have any room left for dessert after all that wonderful seafood! This looks like a place I'd want to visit over & over again. I don't think I've ever seen such delicious looking fish tacos. YUM!!!! I agree they were great looking…and more importantly, great tasting! That is a funny name! The food looks absolutely delicious though! You eat at the most awesome places. I'm picky about fish tacos and these look delicious especially the sauce. As a chocolate love, you had me drooling at that chocolate mousse. One of my blogging friends has a Tues. food link-up you may want to check out –> insidejourneys.com. Thanks so much, Mary…I will check that out for sure! Amen to dating your husband! It's so necessary! The food here looks delicious – especially the fish of the day – yum! 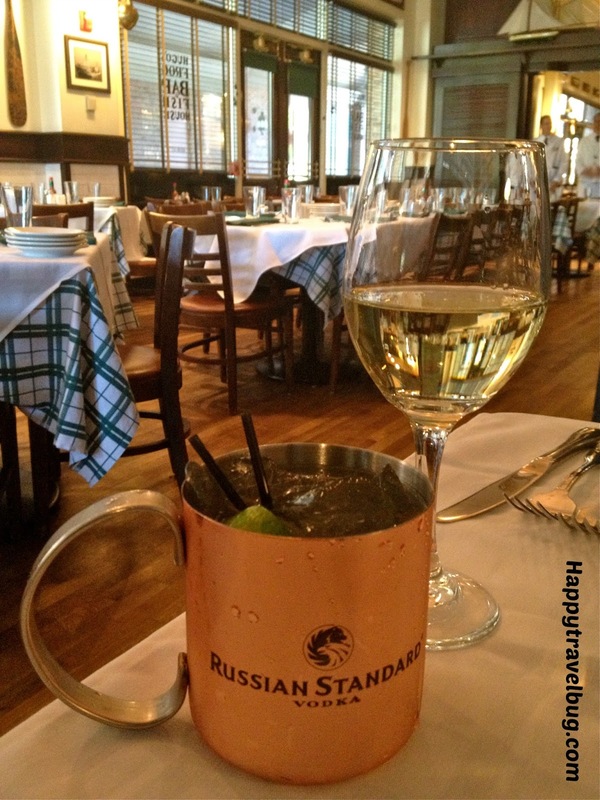 Are Moscow Mules always made with ginger beer? If so, I'll have to give it a try. Yes, always with ginger beer. You must give it a try! No frog legs on the menu? 🙂 Everything looks delicious. I'm originally from the Chicago area and know Naperville a bit. I'll definitely look this place up next time in the area. Goodness, for that price, I hope so! Oh my, it is barely 7 a.m. here and my mouth is watering for lobster bisque!